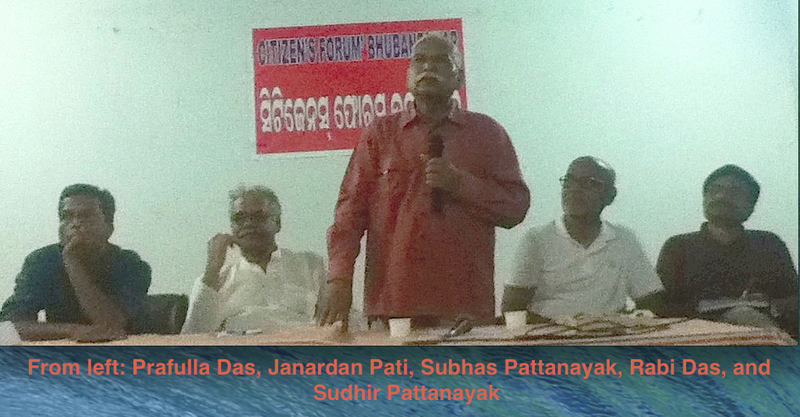 Bhubaneswar based Citizen’s Forum, on May 28, organized a discussion on, “ Role of Media in 2014 General Election” by inviting among others a few prominent media persons of the state. They included Subash Ch Pattanayak (orissamatters.com), Rabi Das (Ama Rajdhani and ex-Editor Pragatibadi/Paryabekhak), Sudhir Pattnaik (The Samadrusti), Praffula Dash (The Hindu) and Basant Majhi of the Samyabadi. Veteran left leader Sri Janardhan Pati presided over the event. Sri Rabi Das initiated the discussion by making a scathing attack on the irresponsible role that media played in the last election. He said, this was the first general election in the post independence history of the country where it appeared as if the media fought the election and won it. In his view, the mass media was preparing Modi since 2012 Gujarat election victory and was therefore influencing public opinion accordingly. The media today is not in a position to think independently. It has become a mouthpiece of the corporate world. They have followed the American Presidential election campaign pattern, said Sri Das. The corporate world by using media has now captured India’s parliamentary democracy. The coming in to power of communal, fascist and corporate forces indicates the grim danger ahead, warned Rabi Das. In his presentation, Sri.Sudhir Pattnaik, Editor of the Samadrusti clarified that there should not be any confusion about the character of media today since they are very much part of the corporations. Media is being used as the ultimate weapon to clear all hurdles that come on the way of an aggressive capital. According to him, the progressive forces have failed collectively to understand media, Modi and the Indian electorate-all of them are controlled by a restless aggressive capital which is globally advancing its agenda, Said Pattnaik. He wanted people to be careful when they treat Modi an autonomous man as he represents an ideology and there are forces behind him who are projecting him as an individual who will deliver good governance only to capture power. These forces have been preparing Modi for this coveted post for quite a long time and at a huge cost. Today, they have become successful. This is how Modi a man who became subject of household discussion because of Gujarat Muslim genocide in 2002 became an extremely popular man in 2014. But it would be wrong to say that the credit of the Modi victory goes to corporate media alone, as RSS was working hardest at all level staring from the booth to ensure that its Swayam Sevak becomes the PM. Modi’s media package was total which included all forms of media-social, print, electronic, physical events etc each one complementing the other. On the contrary, we see progressive forces lacking in all spheres of the campaign. We must understand media and make use of it if we are to succeed. The most feasible way out would be to strengthen non corporate media in all forms, said Sudhir Pattnaik. Media mischief made India’s Parliamentary democracy suffer blatant defeat in the hands a single individual Narendra Modi in Election 2014, said Veteran journalist Subhas Chandra Pattanayak. He pointed out that primacy of Parliament in selection of a Prime Minister was relegated by the media into insignificance, as much ahead of election of the MPs to say who should be their leader, Modi was projected by Media as BJP’s Prime Ministerial candidate, when in fact, he was appointed by BJP as head of its propaganda committee. His Goebbels in media were so eager to reduce India’s Parliament-centric democracy to person-centric, that, to make their design gather momentum, they even were instigating the Congress leadership to announce their Prime-Ministerial candidate before the Parliament election, observed Pattanayak. And, in this design to keep voters dazzled under propaganda for Mr. Modi, the necessity for raising issues for mandate was totally discarded by media, he said. Media did not educate the people on Modi, on all the facets of his political ideology and activities, when he was the only person projected as Prime-ministerial candidate. When ills of capitalism crippled India, in reaction whereto people were so discernibly against Manmohan Singh government, whether capitalism should remain the norm of administration or the country should return to its fundamental resolve for socialism should have been made the issue by the the fourth estate of democracy; but it failed to fulfill this responsibility, as its priority is profit, not the people, he said. Media never wanted to tell the masses what were the causes behind great scams of the UPA government, inflation, price rise, unemployment etc, and what difference Modi would bring, if he comes to power and how. Modi and the media have not uttered a single word against neoliberal economic policies and the corporate raj. As evidenced in Election 2014, Media has abandoned its social, political and nationalistic responsibilities, a deeply saddened Subash Pattnayak told the audience. The Hindu’s Odisha chief Prafulla Dash was extremely critical of the way media played a pro-Modi and pro-Nabin partisan role under the heavy influence of corporations invading the soil of Odisha. They carried relentlessly unqualified pro-corporate news under the influence of unaccountable money. The Mafia in Odisha has taken over media in Odisha, opined Dash. It is not easy to challenge the tyranny of corporate media but unless we strengthen small media initiatives at the grassroots level, there is no hope for a better world, said Sri Dash. Sri Basant Majhi, Associate Editor, Weekly Samyabadi presented statistics suggesting the scale and involvement of corporate power and their money in the last general election. He lamented that the intellectuals and media have become servants of capital today. Henceforth money and only money will decide the future of Indian democracy- a message that one gets from the 2014 general election. In his presidential address, Sri Janardhan Pati did not appear so hopeless and assured all that it will not be wise to write off Indian masses and accept the temporary success of corporate media as their ultimate success. The media will be rendered useless and irrelevant by the masses if it fails to raise issues affecting the common men. The Secretary of Citizens Forum, Sri Suresh Panigrahi offered a vote of thanks at the end. The District belongs to the Chief Minister. The department of home (Police) belongs to the Chief Minister. Like all other Police Stations in the District, Khalikote PS is also equipped with carefully chosen Police Officers worthy of confidence of the Chief Minister. Yet, the killer(s) slaughtered media person Tarun Acharya in the early night of Tuesday sans any fear for the Police even though the PS was in the proximity. Acharya, only 34, was reportedly investigating into certain acts of felony, which could have become very problematic for the rogues. Whether or not those rogues have murdered Acharya, the fact that a journalist could be killed so cold-bloodedly on the road nearing the PS, speaks volumes of how the environment there has become congenial to crime. Various organizations of media persons including Media Unity for Freedom of Press have expressed solidarity with and demanded compensation to the bereaved family and punishment to the killer(s) without loss of time. Mr. Narendra Modi has taken over as the 15th Prime Minister of India on May 26 after President Pranab Mukherjee administered oath of office and secrecy on him and his colleagues in the Council of Ministers. He is now to start seriously with his avowed scheme of “minimum government, maximum governance”, so that the jargon could be practically understood. People have not given him the mandate considering him as a paragon of virtues. They have just avenged the most irresponsible administration, which Manmohan Singh had subjected them to. And, in absence of any other national alternative, people have preferred Modi and his party. So, notwithstanding what he means by “minimum government, maximum governance”, Modi is to take steps to save the country from many a mischief of Manmohan Singh for which the people of India have changed the government. The new government shall have to review the decisions taken during Singh’s decade long administration that were designed against India and are continuing to threaten our present and future generations. As for example, the nuclear deal with USA. The deal was designed not to serve India’s interests, but basically to give “bonanza “ to US firms” (Reuters, August 25, 2007). Senator Joe Lieberman, known for his role in policy making and proximity to President Bush, was sure that the deal will get support of both the Houses of USA Congress because “it is so clearly in the interests of the United States” (Reuters, on August 12, 2007). Convinced that the deal will only benefit USA, and hence, fearing that a future government of India may nullify it in Indian interest, the US Senate, while approving the ‘Henry J. Hyde United States-India Peaceful Atomic Energy Cooperation Act of 2006’ on 9 December 2006 had laid down that the “Indian Parliament must agree to the text” of the said Act, so that the deal shall have legitimate interminable life (‘Insight Briefing’: World Nuclear News, 12 January 2007). But without placing the “text” of the Hyde Act in the Parliament, rather keeping the Parliament in total dark about the said Act lest the Parliament disapproves its “text”, Manmohan Singh had told the Press during an informal chat during the swearing in ceremony of Vice-President Hamid Ansari that, the deal had become final and “non-negotiable” as it was already “signed” and “sealed” (ANI,11 August 2007). Pranab Mukherjee was the most active and relevant partner of Singh in this crime against India. Despite it becoming an international deal because of such treachery of Manmohan Singh and Pranab Mukherjee, it is terminable, because of the fact that the “text” of the Hyde Act was not discussed and approved by Indian Parliament, before it was, as per Singh, “signed“ and “sealed”. This deal has created the necessary environment to destroy India’s nuke independence that our scientists had developed with our own Thorium mother Nature has given us in abundance. The deal Manmohan Singh signed is not a trade deal; it is a “cooperation” deal and legitimatizes transfer of Thorium and the method of nuclear fuel cycle that our scientists had developed with our own Thorium to overcome the USA-led nuke boycott we were facing. In fact, after the deal, within a period of six years, Thorium worth Rs.60 lakh-crores has been plundered (Times Now, 4 September 2013). If Modi is really serious about giving a good governance, this mischief is to be exterminated and the deal signed by Manmohan Singh is to be scrapped and the former Prime Minister is to be subjected to criminal prosecution for the foul play he played against India at the behest of USA. But in this matter, the most discernible ally of the former PM was Pranab Mukherjee. The nation should be helped to ascertain his responsibility. The UPA-II government was noted for mega scams involving thousands of lakhs of crores of rupees and for having reduced the country to a safe place for economic crimes. From Rs.1,76,000 crore 2G spectrum scam to ISRO – Devas S-Band transponders scam that caused, till location, a loss of Rs.2,00,000 crores to the exchequer; from Tatra to Chopper scams involving about Rs.825 crores in the area of defense deal; from Coal scam to the tune of Rs. 1, 86,000 crores to loss of Rs.20,000 crores to exchequer in Sarada group chit fund scam and Rs.11,000 crores in Vodafone tax offense, Manmohan Singh government’s footprints also bear the stamps of Pranab Mukherjee as his closest ally. Prime Minister Modi has addressed his cabinet to issue of black money, in its first meeting. And, soon, if he is sincere in his mission of the yet undefined “maximum governance”, action will begin against the perpetrators of the scams, samples aforesaid. This may be very embarrassing to Mr. Mukherjee. Be it so or not, to ensure that the inquiries into and actions against the scams are free of possible higher influence, Mr. Pranab Mukherjee should voluntarily vacate the President’s chair and help the people’s mandate matter. Old wines in new bottles, Ministers Dr. Damodar Rout, Lalbihari Himirika, Bikramkeshari Arukh, Bijayashree Routray, Badrinarayan Patra, Rameshchandra Majhi, Usha Debi, Deviprasad Mishra and Arunkumar Sahoo will continue in their previous Secretariat Chambers notwithstanding different departments allotted to them. However, when Chief Minister Naveen Patnaik will have his earmarked office in the third floor of the Secretariat, the 2nd floor will have the offices of Atanu Sabyasachi Nayak, Dr. Damodar Raut, Pradeep Maharathi, Pushpendra Singhdeo, Lalbihari Himirika, Jogendra Behera, Bikramkeshari Arukh, Prafullakumar Mallik, Bijayashree Rautray, Badrinarayan Patra, Pradeepkumar Amat and Rameshchandra Majhi. Offices of Usha Devi, Snehangini Chhuria, Sanjaykumar Das Burma, Pradeep Kumar Panigrahi, Asok Panda, Sudam Marandi, Pranabprakash Das, Debiprasad Mishra and Arunakumar Sahoo will be on the 1st floor. The first meeting of the new cabinet has resolved to implement the manifesto for which the people of Orissa have given it the mandate. But wishful thinking will not help. The first Cabinet has resolved to implement the manifesto in phased manner. This looks like a political jargon to hoodwink the people. If the manifesto is to be implemented in phased manner, priority should have been clearly spelt out simultaneously. It has not been done. People have a right to know which item in the manifesto would be the item for implementation in the first phase. Like vultures rush at the carcass, mega Industries that are noted for their acts of empire building at the cost of Orissa’s eco-systems and indigenous people’s living environment, have already made their commanding presence felt in the office of Chief Minister Naveen Patnaik on the very day of commencement of his new phase. So, it is necessary to know how the Cabinet is fixing its priority, which business is to be transacted in first phase and which later and in the last phase. The ruling party that has bagged the mandate is marked for its peculiarity. It is a combine of persons who in attire appear like leaders, but in reality, loyal to a single person, whom they call ‘Supremo’ (the Supreme boss). Being thus a boss-based party, its ministers are not made with the ingredient to go against the whims and caprices of the boss, who is marked for his eagerness to help mega industries, even if that harms the people with enforced displacement, elimination of their permanent sources of earning and assets that keep them self-employed and over and above these debacles, infests them with industry-induced killer diseases that destroys their economy and hampers their future generations. This cabinet is undoubtedly a new incarnation of cabinets of sycophants like the preceding one. If its boss Naveen Patnaik wants the entire Orissa to be handed over to mega industries, not a single member of the Cabinet is supposed to stand up and say ‘no’ to that design. So, the new phase of the government has commenced with clouds of the mega industries’ hegemony shrouding over the sky of administration. Most of the members of the last cabinet, who were taking “orders” from the Chief Minister’s private secretary, are also in the present cabinet. We had warned the Chief Minister about rise of a super CM in his office; but that was ignored. If the BJDians have the honesty to tell the truth, from their mouths only it may emanate that all ticket-aspirants were submitting their application with bio-data for ticket to the said private secretary only, when in real life he is a government servant, not expected to play any role in party-politics. Unless this super-chief-minister syndrome is not removed, the new Cabinet may fail to deliver, howsoever well-worded be its resolutions. The Chief Minister should gather intelligence on the staff of his own office to know what really is happening behind his back, in his name. The scheming bureaucrats have reduced the CM’s office to such a fort that the Press is not allowed to enter into it in pursuit of information. Since independence, in no Chief Minister’s time, accredited journalists were denied entry into the CMO, as is happening in Naveen’s tenure. Accreditation is granted to experienced journalists under a set of Rules to grant them access to sources of information. But, this provision is of no prevalence as far as the Chief Minister’s office is concerned. Have the bureaucrats reduced the CMO to a den of secret deals? Is it so under orders of the CM? If not, who has devised this trick of keeping the CM de facto distant from the Press? Intelligence wing of the police is under the CM and available to serve him with correct reports on how power-centers had grown in his preceding tenure in his own office and can enlighten him on ongoing activities of bureaucrats in his office even now. Let him wake up to the issue and keep under leash the officials of his own office, if he really wants to honor the mandate given to him by the people. If his fourth term should be a successful one, he is to reshuffle his cabinet in matter of portfolios. Allocation of portfolios is prerogative of the CM. Yet, it needs application of mind, in State interest. Orissa has the labyrinthine predicament in areas of Mines, energy and industry. I am not mentioning about Works and Water resources, Home and General Administration, because the CM has kept these portfolios with him. But senior ministers, who are placed in cabinet rank, should have been given the responsibilities of the departments of utmost public importance like Mines and Energy. When a junior minister in MoS rank Prafulla Mallik has to administer the Mines department, energy is given to Pranab Prakas Das. Without any prejudice to their capabilities, one may deem it proper to wish that serious thought should have been given to these departments as they are so full of intricacies that need highly experienced hands. Allocation of portfolios to ministers is the prerogative of the Chief Minister. But the Chief Minister represents all the people of the State. He should hear if any fellow citizen advances any well meaning advice. One such advice is based on improvable allotment of departments. Experienced and capable Debi Prasad Mishra has been given the Industry portfolio; but he is also saddled with the department of School and Mass Education, which many people believe never-to-be-normal. The School and Mass Education department, from bottom to top, is in such a mess that a highly experienced and commanding cabinet Minister should have been put in its exclusive charge, as Industry needs an exclusive Minister. Debi Prasad is fit to lead each one of these departments, but not the both; because they are not compatible.By putting both of these departments under the charge of Debi Prasad, Naveen has done injustice to both the departments. Debi babu should be divested of any one of these two departments, so that he can give proper attention to the other one. Similarly, veteran Dr. Damodar Raut has been put to incompatible portfolios, such as Co-operation and Excise. How Excise is relevant to Co-operation? He could have been given Agriculture and Co-operation or Revenue and Excise, if his services are necessary for more than one department. Bikram Keshari Arukh has been given Environment and Jungle with Parliamentary Affairs and Usha Devi has been put in charge of Women and Child Development and Planning where as Snehangini Chhoria has been given Handloom and Handicrafts and Mission Shakti. Should it not have been better to give Parliamentary Affairs and Planning to Arukh and in place of planning, the department of Mission Shakti (Women empowerment) to Usha Devi? Arun Sahoo has been given Panchayatiraj and Law. Are they not heavy enough to be kept under the care of two Ministers? Sanjay Das Burma has been given Food and Consumer Affairs and Technical Education and training; whereas Pranab Prakas Das has IT and Energy and Prafulla Mallik is given Steel, Mines and Labor. For making the charges compatible, Law and Labor should have been given to any one of them, IT should have been tagged with Technical Education and Training along with Industry. Unless different departments a minister is to handle are compatible, ministers not being subject matter specialists, the burden will give enough scope to the executive to mislead or hoodwink the minister. I am afraid, the Chief Minister has not applied necessary mind to this phenomenon. He has just done a political exercise to distribute departments, but not a foresighted exercise. To make the Cabinet the master of administration, the CM will do better by reallocating the portfolios. Orissa Governor Dr. S.C. Jamir administered oath of office and secrecy to members of the new Cabinet in Raj Bhawan this forenoon. The ceremony began with Mr. Naveen Patnaik swearing in as Chief Minister at 10.10 AM followed by 11 Cabinet Ministers and 10 Ministers of State. The ceremony ended at 11.10 AM. Dr Damodar Rout, Debi Prasad Mishra, Bikram Keshari Arukh, Badrinaryan Patra, Lalbihari Himrika, Bijoyshree Routray, Usha Devi, Jogendra Behera, Pradeep Maharathy, Pushendra Singh Deo and Pradeep Kumar Amat took oath as Cabinet Ministers,whereas Arun Sahu, Ramesh Majhi, Prafulla Mallick, Pranab Prakash Das, Sudam Marnadi Dr Pradeep Panigrahi, Snehangini Chhuria, Asok Kumar Panda, Atanu Sabyasachi Nayak and Sanjaya Dasburma took oath as Ministers of State. Most of the sworn-in Ministers touched the feet of the Chief Minister before and after taking oath of office, oblivious of how such sycophancy is an affront to the dignity of the constitutional posts they are bestowed upon with.Portfolios are yet to be distributed. But the good thing is that, Naveen has eased out some of his former cabinet colleagues, who, in public perception, were not of the stuff that matches political responsibility and probity. The Chief Minister being the same as of the last term, it will be proper for the new Cabinet to begin with taking stock of assurances given by the government in the last Assembly and to discourage loss of Cabinet resolutions in bureaucratic labyrinth at the stage of execution. When the new team starts functioning, its collective responsibility should be emancipation of people from the pernicious grip of trade and industry that have posed severe threat to environment and eco-systems of the State. It would be better to keep the future generations of Orissa and their right to the State’s natural resources in mind before squandering them away for touted benefit of only the present generation. The last Government had done a lot of damage to the contemporary and future generations of Oriyas. Yet, the mandate given to Naveen is with the last hope that his approach may change, good sense may prevail and State terror may end. With hope against hope that this new government would be pro-people instead of being pro-power, we welcome the new Cabinet. Naveen Patnaik to propitiate Jagannath before oath taking; but which Jagannath: the Secular or the Communal? On bagging fresh mandate, BJD chief Naveen Patnaik is scheduled to take oath as Chief Minister of Orissa for the forth term today. But before taking the oath of office, he is to visit Puri to propitiate Sri Jagannath. Which Jagannath he is to propitiate is the question; because Jagannath is now not the one that belong to the Oriya orientation. He has become what originally he was not. He has now two aspects: secular and communal. People of Orissa have a right to know to which aspect their Chief Minister adhering. Originally Sri Jagannath is Buddha, the supreme leader of ancient Oriyas, who, to save the democratic uniqueness of his motherland Tosala (modern Orissa), had rushed to Rajagrha (Magadh) – the heartland of Vedic imperialism – to obstruct the spread of autocracy by uniting the Vajiyan Tribes in the pattern of Orissa’s tribal democracies against empire building. The Magadh emperor Bimbisar had stopped empire building on being convinced of the irrelevance thereof and had adopted Buddha as his friend, philosopher and guide. The Vedic chauvinists had instigated his son Ajatasattu to take over Magadh by putting his father behind the bars, which he had done and through his Brahmin minister Bassakar, had tried to dissuade Buddha from obstructing empire building. Buddha had rejected the request, as a result of which, Ajatasattu had failed to spread his empire beyond what Bimbisar had built. When Vedic empire had thus to stop at Magadh, the people of Tosala were safe to pursue their democratic practice because of Buddha. Hence to the inhabitants of his motherland Orissa Buddha became the most revered master and his tenets became their ism. The entire Orissa became a land of Buddhist practice and his birthplace Kapilavastu (land of red soil – RANGAMATIA) in the Dhauli Guri region of Bhubaneswar became the fountainhead of Buddhism, which was the most insurmountable obstacle to spread of Vedic empire building. To destroy this fountainhead, Asoka, the wicked emperor of Magadha, had attacked Orissa at Dhauligiri and having been brought to knees in the historic Kalinga War, where Orissa’s women warriors had even overwhelmed him, he had fled with life after adopting Buddhism as his creed. He, however, used this conversion to Buddhism to destroy Buddhism in the guise of spreading the philosophy, which history is yet to note. (Subhas Chandra Pattanayak, Sri jaya Devanka Baisi Pahacha, Bharata Bharati, Cuttack). Like Gorbachev destroyed USSR by using Perestroika and Glasnost, Asoka destroyed the atheist uniqueness of Buddhism by making Buddhists accommodate interpolation of theism on their philosophy through the epithet “Devanam Piya” (beloved of the Gods) that Asoka used for himself while posing a great patron of Buddhism (Ibid). However, Buddha’s support to matriarch democracies of Orissa had encouraged Oriya tribes to revere him as the embodiment of mother Nature and lifted him to the level of deity Jaganta that they were worshiping in a wooden log as a symbol of mother Nature. While doing so, to Jaganta (the wooden log shaped like a female torso representing reproductive qualities of nature) they had added drawings of a pair of ‘Thana’ (breasts) recognition of the mother’s ability to feed her child. Thus Jaganta had evolved as ‘Jaganta-tha’ (Ibid). The great Buddhist leader of Orissa, Indrabhuti, who founded Bouddha Vajrayan, elevated this Jaganta-tha to Jagannatha, who, to him, was non but Buddha. After demise of Buddha, his followers were projecting him as omnipresent (Gaganopama) and Bouddha Shunyavad was trying to safeguard the Buddhist tenets. But, an object of direct worship was necessary to face the image worshipping design of Brahminism. Indrabhuti in that circumstances had tried to develop an idol of Buddha in a pattern most acceptable to majority of Orissa, the tribals. So, he amalgamated Buddhist tenets to the tribal deity Jaganta-tha and created Jagannath. Bhaktyaham sarva bhavena vaksye tat sadhanam param” (Two Vajrayan works, p.-31). And since then, Jagannath has remained Buddha to Oriyas. In innumerable Oriya works of letters and scriptures, Jagannath is depicted as Buddha. Vedic chauvinists have rushed to Puri and established various Maths to transform Jagannath from Buddha to Vishnu, a Hindu deity and Brahmins have promulgated caste apartheid in his abode with the help of their patron kings and post-independence administration. Yet, till date, his worship as well as preparation of Mahaprasad are based on Tantra. His most popular public rituals such as Snana Yatra, Ratha Yatra, Naba Kalebara et cetera are all tantric in charecter he himself is known as the God of Tantra (Bhairav) and Goddess of Tantra (Daksina Kalika). So, Jagannath at present has two distinctly opposite identities. Originally as Buddha he is entirely secular and under hegemony of the Brahmins, he is totally communal. Now when foul play of plutocracy has pushed politics into religious polarization, and communalism has replaced political ism as the issue in election, of which Naveen is an offshoot, it is pertinent for him to let people know as to which Jagannath – the the secular or communal – he is going to propitiate before taking the statutory oath of office as the State’s Chief Minister.